The text-align values can be either left, right, or center. And when there are other stylings, I want to omit them. How can I do that in PHP? Maybe I was not clear enough in my original question. What I mean is that I want to convert contents with text-align:center to be wrapped by <center>, and contents with text-align:right to be wrapped by <right>. And when there is no text-align styling, I do not need any wrapping for that div. Thank you. 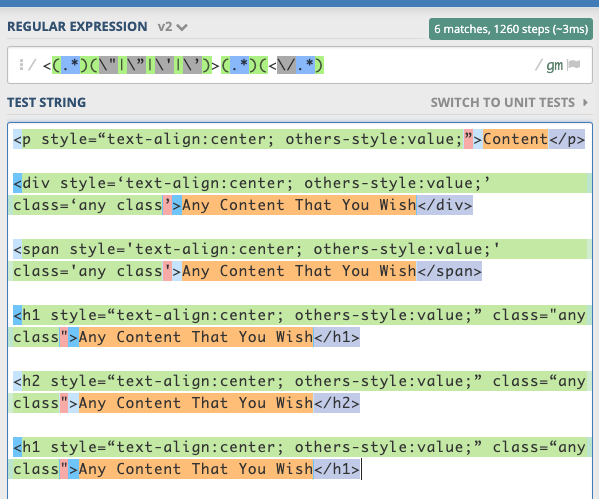 The RegEx divides your inputs into three groups, where the first and third groups can be assigned to open/close p tag. You can further expand it with this RegEx for any other tags/quotations/contents that you may wish. It would divide any tags with any quotations (" or ” or ' or ’) into five groups where the fourth group is your target content. This type of RegEx may be usually useful for single occurrence non-looping strings, as it uses (.*). string(38) "<left>Any Content That You Wish</left>"
string(40) "<right>Any Content That You Wish</right>"
string(44) "<justify>Any Content That You Wish</justify>"
string(44) "<inherit>Any Content That You Wish</inherit>"
string(38) "<none>Any Content That You Wish</none>"
string(86) "<h4 style=“others-style:value;” class=“any class">Any Content That You Wish</h4>"
Not the answer you're looking for? Browse other questions tagged php html regex replace preg-replace or ask your own question. 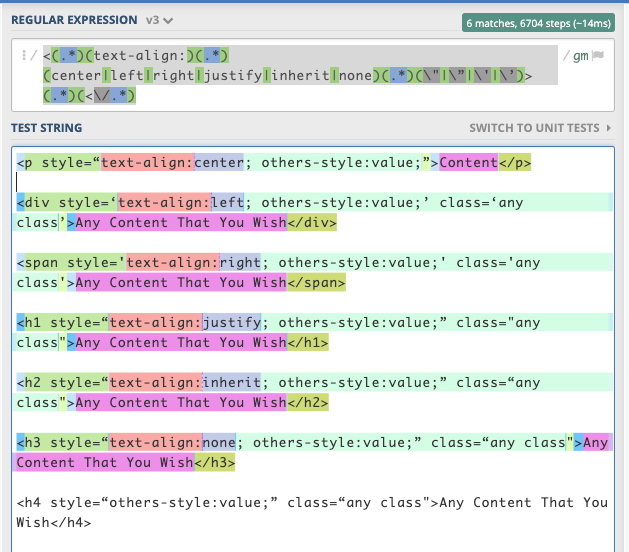 How to perform regex tag conversions to all occurrences in a string in PHP?